Toccoa River Cottage is a cozy studio home on the beautiful Toccoa River! Beautifully appointed and romantic, the Toccoa River Cottage is the perfect destination for a getaway for you and your special someone. Enjoy beautiful views of the river while you enjoy the hot tub on the lower patio area,, sit on the deck, or fish or stroll along its borders. Just 2.5 miles from downtown Blue Ridge, but seemingly miles away, the Toccoa River Cottage with its upscale amenities and breathtaking views will be a place you’ll want to come back time after time! 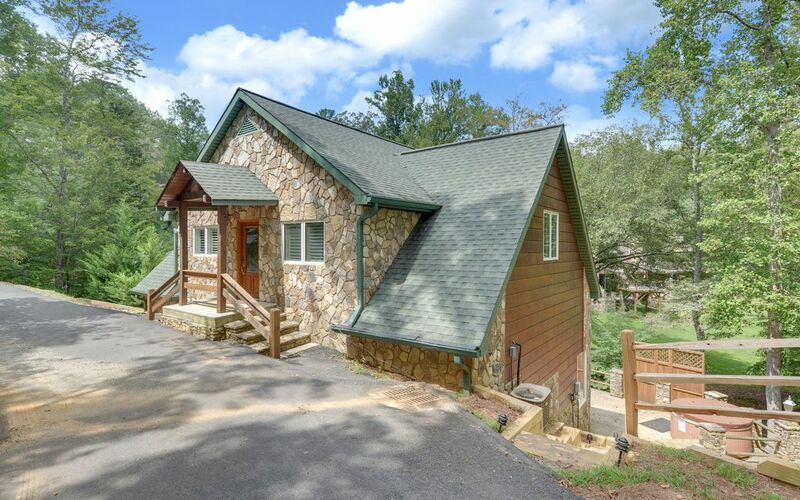 If you have a medium size group or need additional space, check-out our new Toccoa Overlook Cabin (listing #1430691) which is connected by trails along the river OR 1/2 mile by car. The Toccoa Overlook Cabin can accommodate up to 15 guests. See https://vrbo.com/1430691. Kelly and Eric love Blue Ridge and always wanted to have a rental property to share the fun and adventure with others. We take great pride in providing a safe and comfortable experience for our guests and want to ensure they have a memorable experience in Blue Ridge. An easy drive from Atlanta, but truly a world away! We loved the proximity to the Atlanta area and the easy drive up I-575. The combination of the privacy and river views, yet close proximity to downtown Blue Ridge, were just too much to turn down! We loved it the moment we saw it! Prime footage on the Toccoa River. Not only is it beautiful, if you're a fisherman you will be amazed at the number and size of the Rainbow, Brown and Brook trout in this part of the river. Nicely appointed bathroom with tile floor and shower. Linens provided. WiFi included. Also Netflix is available. Modern kitchen with beautiful hardwood floors, custom cabinetry and granite countertops. SONOS Music system with Spotify subscription allowing individual artists selection or genres, top charts. Bring your own and launch steps away from the cottage. Overlooking the river. Drained and refilled after every guest. Private chef and massage services can be scheduled. See links section for details. Loved the home! Very good location. Easy to get to. River and creeks on property are very relaxing. Thank you for sharing your home. Words cannot express the amazing time we had at the Toccoa Lodge. Even though the pictures are beautiful, they don’t even do it justice – the Lodge is even more beautiful in person! We held a small wedding ceremony at the Lodge with family that is from out of state – they all said it was the best weekend of their lives. The Lodge caters to both adults and children – trust me, no one was EVER bored! In fact, we feel like we needed even more time to enjoy all the amenities the Lodge has to offer. We’ve never met nicer people – Mike, the Property Manager, did anything and everything he could to make our stay and wedding day the most memorable of our lives. Mike is so personable and was there for every question we had. Kelly is absolutely fantastic – she is extremely responsive and makes you feel unbelievably welcome in her home. Thank you so much, Mike and Kelly! My husband and I stayed here for our 10 year anniversary. We had the best time. The cottage was absolutely amazing! Right on the water and close to downtown. It was very cozy and relaxing. Kelly and her property manager Mike went above and beyond to help me make it extra special for the occasion! We would definitely recommend this cottage! Location, comfort and Riverview make this place a perfect stay. We found the home in very good condition and clean. Would highly recommend it. It was as advertised and well priced. Comfortable well appointed studio/cottage. Great spot for a couple. Close to town but quiet. Great river view. Absolutely beautiful and cozy cottage! Perfect place for a couple to get away. Very private. Has everything you'll need for your stay. This is our 2nd time staying there and will definitely be returning. Would highly recommend this cottage. Thanks, Kathy! So glad you had another great stay at the Cottage! We greatly appreciate you recommending the Cottage to others! See you next time! Surround yourself with beauty, relaxation and natural fun in Georgia’s Blue Ridge, only 90 miles north of Atlanta via I-575 and Hwy 515, but a million miles away from the traffic, stress and anxiety of the city. With 106,000 acres located in the Chattahoochee National Forest, Blue Ridge is definitely the cure for whatever ails you. Fannin County is the Fly Fishing capital of Georgia. There are excellent fishing streams and rivers including the Toccoa River. The depth of the river varies but is approximately 3-4 ft deep in front of the cottage. You can fish directly from the banks, in a float tube, or with waiters in sections around the cottage. Catch and Release is required along this river section and single barbless hooks minimize risk to the fish. The Cottage is one mile north of the Blue Ridge Dam, and the dam releases once or twice a day. You can find the release times on the following website http://www.tva.gov/lakes/brh_r.htm. During the dam releases, the river rises and moves more quickly. Downtown Blue Ridge offers several great restaurants, shops, and activities. Blue Ridge Brewery is a local favorite and offers local musicians on Friday and Saturday nights. Hucks Country Store is a must visit place especially for kids with lots of toys, puzzles, and old-time candy favorites to choose from.